Nava Ruthfield and Holly Reichert, aka Matilda, teach us some much-needed acting techniques that they use themselves to warm up before a show. When witnessing Jim and Michael's moves, both actors were heard repeatedly saying, "Amazing." We may never win a Tony, but Nava and Holly certainly have a chance! Nov 8-Dec 30th at the Francis J. Gaudette Theatre in Issaquah. 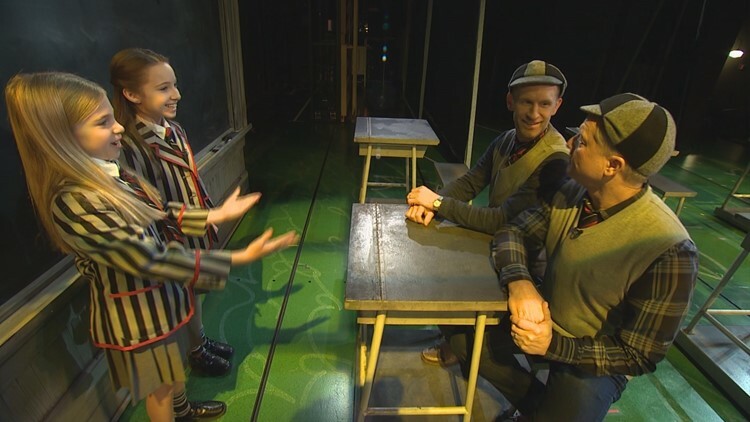 Nava Ruthfield and Holly Reichert play "Matilda" at Village Theatre in Issaquah. Here they attempt the impossible...teaching Michael King and Jim Dever how to dance. About the show: "Roald Dahl’s beloved magical misfit comes to Village Theatre’s stage in the hit musical that swept up five Tony Awards, seven Olivier Awards, and was named TIME’s #1 Show of the year in 2013. Matilda is the story of an extraordinary girl genius armed with a sharp mind and a vivid imagination who dares to take a stand and change her destiny. With the help of her kindly teacher (and a little magic), this miraculous girl proves that everyone has the power to change their story. This West-Coast Premiere production features an incredible cast of 15 local youth who have been training together since June, and they’ll be joined by some of the Puget Sound’s best performers. Together, they’ll create a magical experience for grown-ups and mischief-makers alike."